Your thesis may be a rather large project, or it may simply be the definition of your current essay. Whichever it is, you are going to have to apply similar principles. 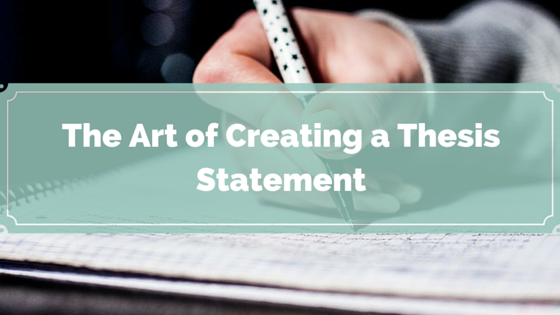 Your thesis statement is the thing that sets up your entire work. It sets up your entire essay and in a way it explains to the reader why they should bother reading your work. That is mainly what your thesis statement does. You are either making a claim at the beginning of your essay, or you are setting up your argument. They can be one in the same, but the point is that it is a definite article. You are not suggesting a direction for your work, nor are you trying to hook people into reading. It is not like setting up a mystery story. In this case you are giving away the mystery right away. The only real exceptions are research papers. Not to labor the whole claim or argument point, but that is what you are supposed to be writing with your thesis statement. An opinion can be given within any written work, but not within the statement of your thesis. If you are using words such as, “I believe” or “I think” within the thesis, then there is a big chance you are making a mistake and a bigger chance you are going to score poorly for your work. If your work was a train, then your thesis is the track. If you are deviating from the point of your thesis then either you are wrong to deviate or your thesis is not comprehensive enough. Maybe you were too specific, or maybe you have genuinely found more to your work than you initially thought. If the latter is the case, then go back and improve your thesis so that you do not appear to be deviating from the point in your written work. A big thesis paper is going to take a lot of preliminary work and the written work itself can take you months or even years. If you are simply writing an essay, then your statement of thesis still needs work. This is because you are writing it near the beginning of your essay, and if your thesis is the rail road that points the direction of your work, then how can you set your direction if you do not do work beforehand. If you do not do work beforehand then half way through you will probably find a bit of research that contradicts your entire efforts and you have to start again from scratch. Burying your thesis in words is really dumb. If your thesis is wordy then it should be clarification, but do not forget you can more deeply clarify your thesis later. If you are too vague then do not expect a good grade. A crude example may be where you should write, “The reason some women date jailed murderers” but instead you write, “Why women are crappy at picking men.” Even vague words should be avoided, such as “Kind of” or “Mostly” or “In all probability.” If you are writing things such as that then you have not worked hard enough on your thesis to start with.